UM faculty and alumni are harnessing the power of art and communication techniques to highlight climate change issues across a variety of media. Dry riverbeds. Lone polar bears on drifting ice sheets. Coastal cities ravaged from stronger hurricanes. Artists and communicators are making climate change visible and visceral as a way to compel people into action. They are distilling complicated science into visual storylines that evoke emotion while conveying the threats of climate change or the hope of human ingenuity to save the planet. What struck University of Miami alumnus Nate Dappen, Ph.D. '12, most during a 2013 journey through equatorial Africa was the disappearance of a vertical mile of ice off the glacial Rwenzori mountain range, a scene the filmmaker and photographer captured in the award-winning film Snows of the Nile. Dappen, who studied evolution and ecology, and creative partner Neil Losin, both academics turned artists, filmed and produced their expedition through the Rwenzori range known as the "Mountains of the Moon" with their company, Day's Edge Productions. The duo also filmed and produced a one-hour documentary, Islands of Creation, which aired on the Smithsonian Channel in 2015. The film featured UM evolutionary biologist Albert Uy, in the Department of Biology at the College of Arts and Sciences, and his cutting-edge research on speciation in the Solomon Islands. Filmmaker Nate Dappen stands in a glacial cave in the Rwenzori Mountains in equatorial Africa. Photo credit: Neil Losin and Day’s Edge Productions. Dappen and Losin aim to produce visually stunning images and film to help amplify the voices of people, animals, and ecosystems that would otherwise never be heard. Through pervasive visual storytelling, Dappen hopes to accumulate his drops in the ocean of change, eventually reaching a critical mass by chipping away at the collective consciousness. 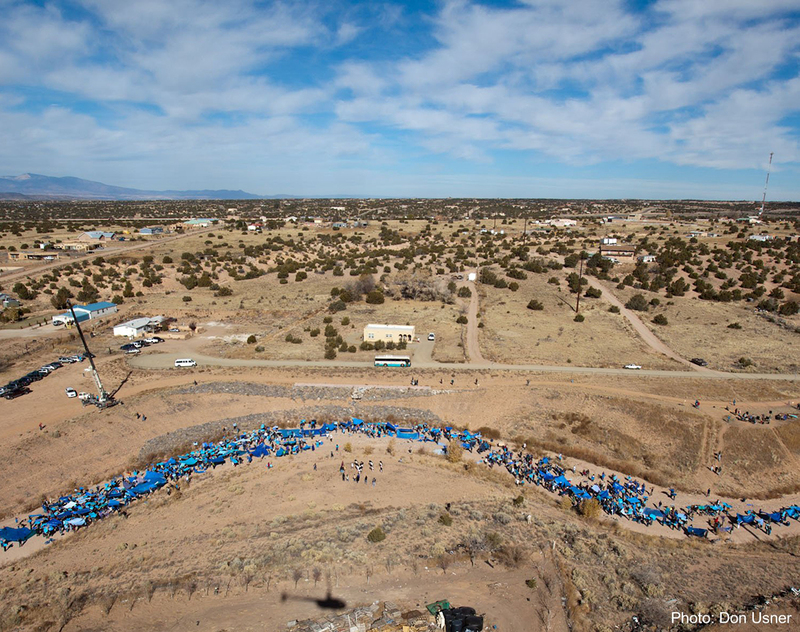 Throughout history, Dappen explains, those that are part of civil rights, social and environmental movements "fight up against the tide of opposition and it doesn't seem like change is ever going to happen, until all of a sudden it does." UM faculty are also studying how visualization techniques are used to tell stories and build social movement momentum. 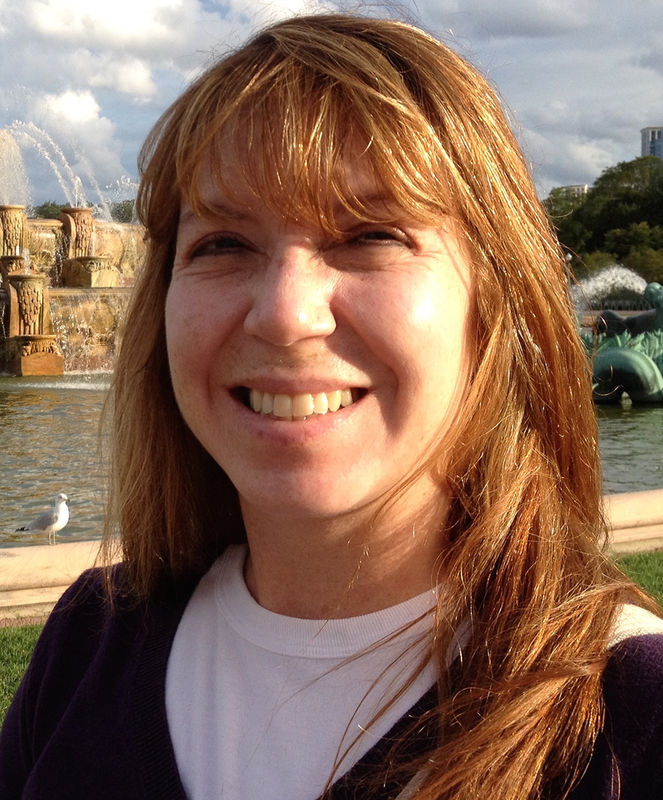 Michelle Seelig is fascinated by how multimedia is used to advocate for a cause. Her latest book, Communicating the Environment Beyond Photography, examines how visualization, particularly photography, has been used to not only document nature as it is, but to also motivate the public to protect it. 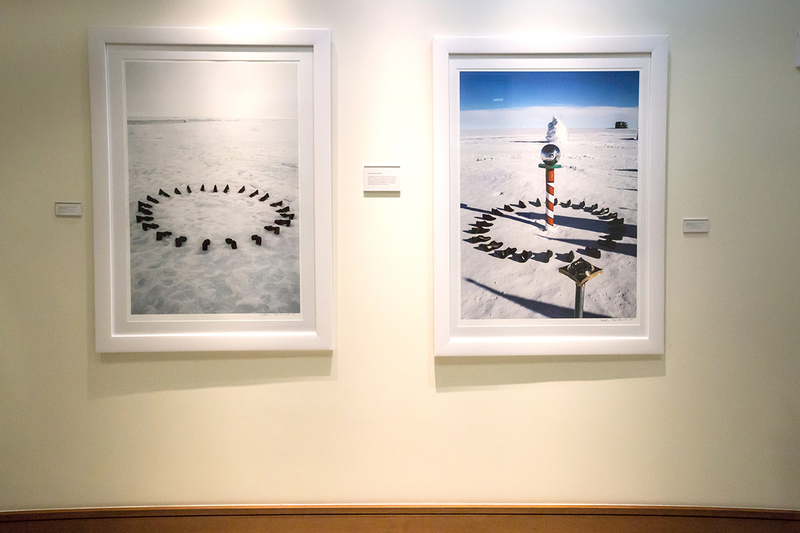 Inspired by her love for famed environmental photographer Ansel Adams, Seelig, an associate professor in the School of Communication, studies how communicating environmental concerns such as climate change can often be overwhelming to audiences. "It's not that people don't believe the science," she says, "it's that they're so overwhelmed by it and they disengage." The key, she says, is communicating problems and their solutions locally so that people feel vested. This helps empower people to solve a seemingly insurmountable problem such as climate change by taking concrete steps in their everyday lives. For her recent book, Seelig surveyed media and communication tactics used by over 30 organizations that work to spur action in combating climate change. 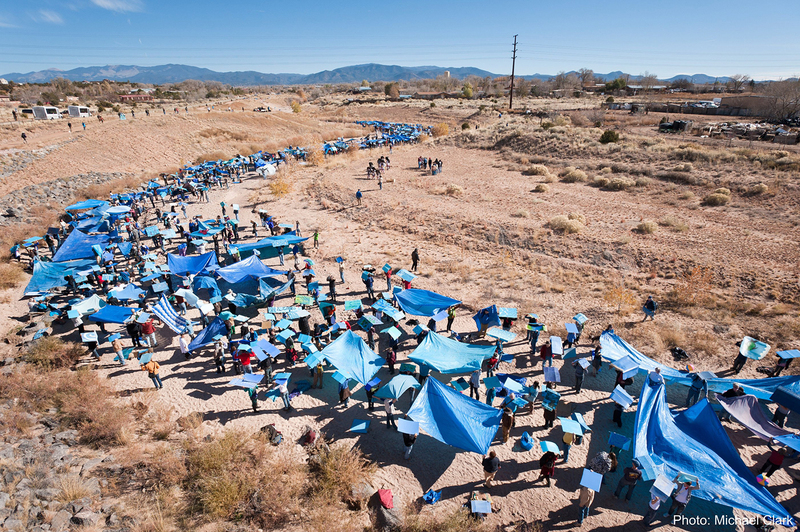 One organization, 350 Earth, uses public art for social movements, such as a 2010 event that drew over a thousand people to stand in the dry Santa Fe Riverbed. Prolific environmental and science artist Xavier Cortada, B.A. '86, M.P.A. '91, J.D. '91, knows a thing or two about the power of visualization. Michelle Seelig, associate professor in the School of Communication. UM alumnus and artist Xavier Cortada poses in front of his artwork, Longitudinal Installation. Cortada uses various forms of media to convey the gravity of important social and environmental issues such as climate change. Now an artist-in-residence at the FIU College of Architecture + The Arts and the FIU College of Arts & Sciences School of Environment, Arts and Society, Cortada has created several participatory eco art projects in Florida, including a mangrove reforestation project, a wildflower garden planting initiative, and an urban habitat reforestation effort. 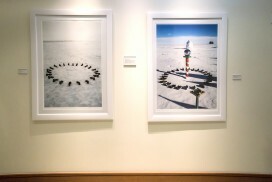 Cortada has also produced art on every single continent, including a 2007-2008 piece entitled Longitudinal Installation in the North and South Poles. 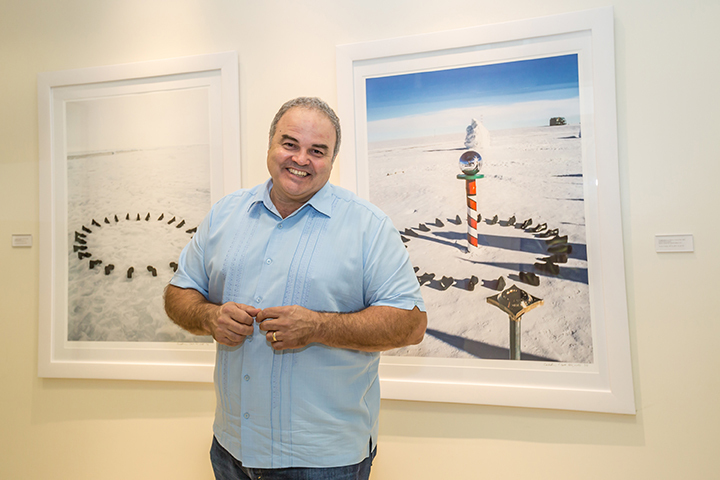 A fiercely proud three-time UM alumnus, Cortada has been connected to the University for more than three decades and owes his unique artistic perspective to his interdisciplinary studies at UM, ranging from biology to law and social justice issues. 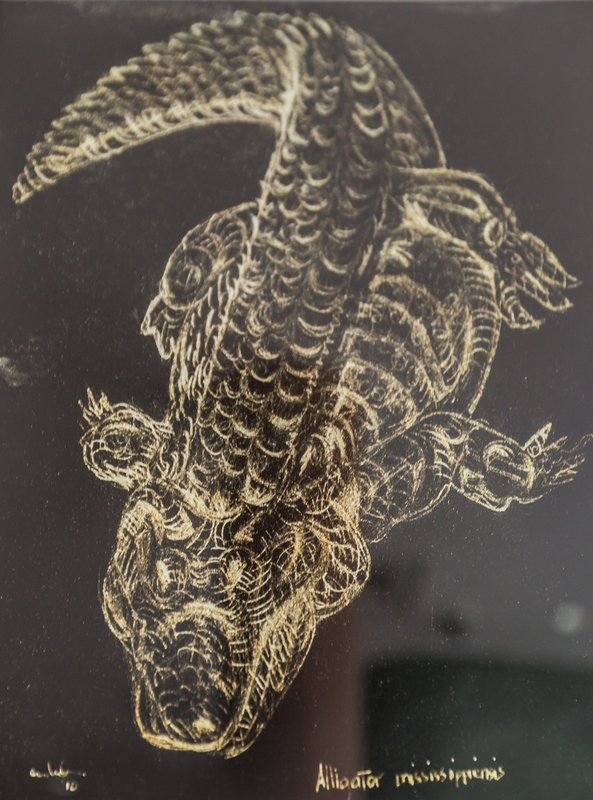 While in the green zone in Cyprus in the Mediterranean, Cortada first began using art to communicate environmental concepts by showing fighting Turks and Greeks how nature connects us all. "We are one ecosystem, one biology, one DNA," he says. 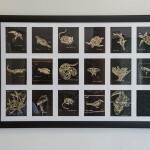 This sense of our whole world being interconnected is portrayed through most of Cortada's artwork, as is a strong hope for the future. Cortada strives to encourage school-age children to engage in science and eco art. After all, he says, children are our future. Tap or double-click any photo to start slideshow. Sante Fe Flash Flood event hosted in 2010 by 350.org. 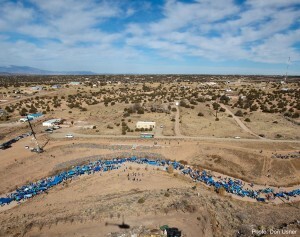 Aerial and satellite images of people draped in blue tarp standing in the endangered river provide a stark reminder that climate change is having very local impacts to many communities. Photo credit: Don Usner and 350 Earth. 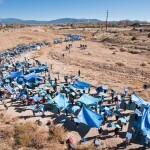 Sante Fe Flash Flood event hosted in 2010 by 350.org shows aerial and satellite images of people draped in blue tarp standing in the endangered river provide a stark reminder that climate change is having very local impacts to many communities. Photo credit: Don Usner and 350 Earth. 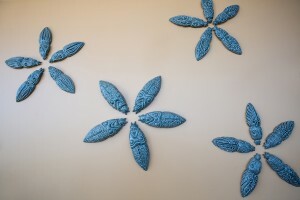 Photographs of Xavier Cortada’s artwork hang in the Newman Alumni Center on the Coral Gables campus. Each shoe at the poles represents a person in the world below (or above), and how they are impacted by climate change. 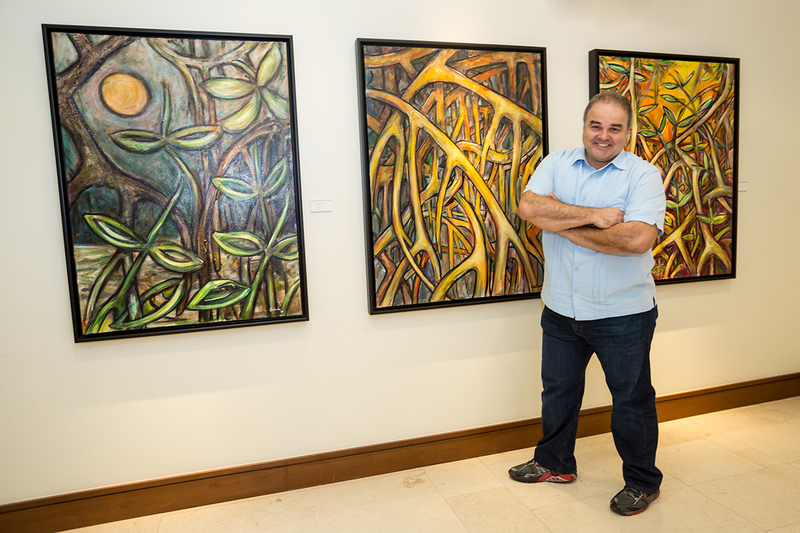 Artist Xavier Cortada stands in front of one of his many eco-art pieces, this one depicting Florida’s mangrove forests. 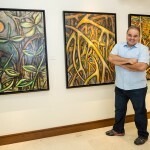 Artist Xavier Cortada has donated numerous art pieces to UM, many of which are displayed throughout the Newman Alumni Center on the Coral Gables campus. 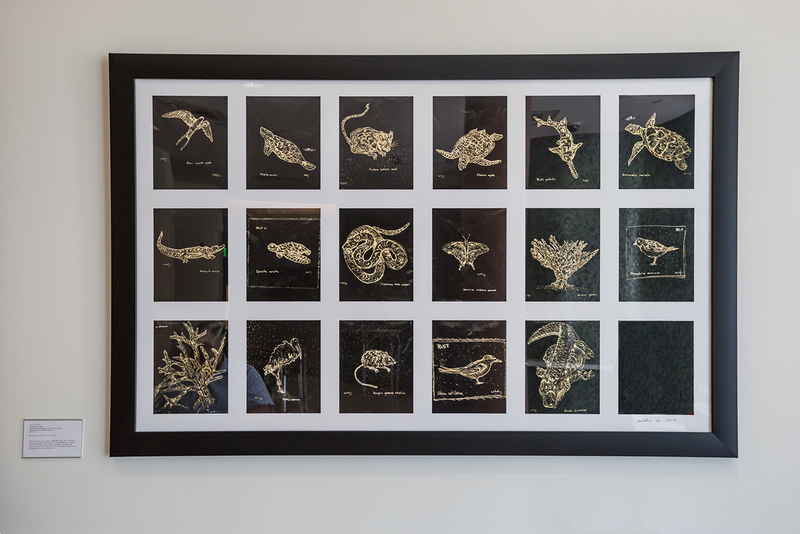 One piece, entitled 80.15 W, depicts the 17 threatened and endangered species of Biscayne National Park. One of the carbon paper drawings from Xavier Cortada’s artwork 80.15 W depicts the American Alligator species. 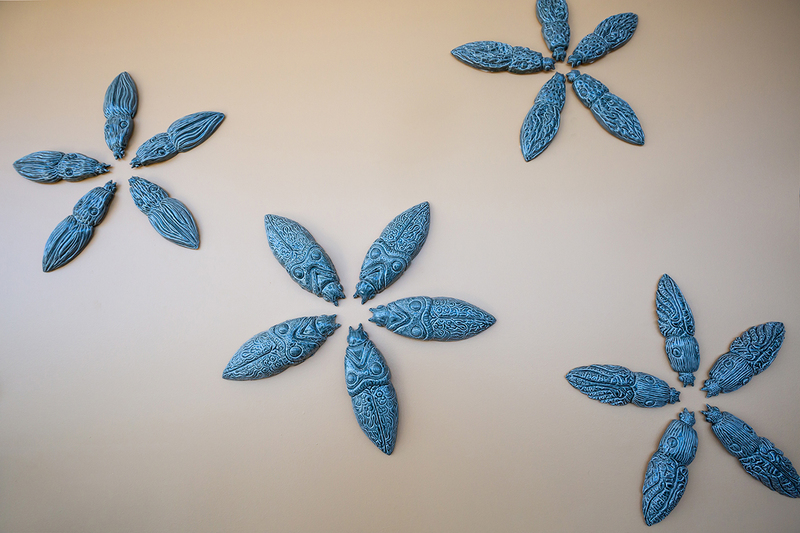 Xavier Cortada’s artwork Cucuyos is a series of porcelain flowers that, upon closer look, are comprised of Florida click beetles, ecologically-important pollinators.